With such a positive and welcoming community, I feel as though I can be real and not hide behind a masked and false image. So, let's be real for a second. * another post for another time?? It made everything THAT much harder. But I have to clarify that I have actually OVERCOME a lot of those anxieties. I could almost say that I do not get anxious over those situations anymore but there are definitely moments when I feel more anxious than others. I think I've basically just grown out of that anxiety and have moved on to the next. And boy, haha- boy oh boy OH BOY DOES THIS ONE LIKE TO PLAY MIND GAMES. It happens randomly and it's usually whenever I feel overwhelmed. What I want to talk to you about is how anxiety feels. There are so many people who interpret anxiety as nothing more than feeling stressed or nervous... and that is not at all the case. Those people will most likely ask you "so what's bothering you" and I GUARANTEE, YOU WILL NOT HAVE AN ANSWER BECAUSE YOU DON'T KNOW. Anxiety is so much more than feeling nervous. Anxiety is not only mentally disruptive but physically as well. When feeling an overwhelming amount of anxiety, your senses are dialed up A LOT. You feel restless. You're shaking. You are unable to focus on the task at hand because your mind keeps jumping from one thing to the next. Your mouth is dry. Your hands are cold but sweaty. You feel claustrophobic- as if everything is closing in on you. You are unable to sleep due to the jittery nerves swimming around in your stomach. You feel a sense of dread- unable to do anything you typically enjoy doing. You might even experience thoughts of self-doubt. Such as, I can't do this. Why am I like this? This is all my fault. Now, I'm not saying that everyone feels this way, but these are symptoms I have experienced before. I remember it being late 2013 (or early 2014?)... I was still struggling with a lot of social anxiety that year but at the same time, overcoming a huge amount of it. I recall having this moment that resulted in my mother asking me What's wrong? What is making you anxious? And then her getting upset with me because I couldn't give her an answer. I had absolutely no idea what was making me feel this way. Most of the time, you don't know what is making you anxious. And it's true! You could be having a good ol' time and then all of a sudden, anxiety taps on your shoulder and says wasssup. It's okay, you are not alone. I know this is the first advice anyone can give to someone who is experiencing anxiety but it definitely is the most important. Set everything aside and take a few moments to sit in a quiet place and inhale/exhale calmly. There are breathing apps you can get that will tell you how long to inhale for and when to exhale. There are also breathing exercises that you can find on Pinterest. Sometimes when you have anxiety, you forget to feed and water yourself. Believe me, I've been there. You can't forget to do this, my dude. Your mental health is a lot better when you're well nourished and not dehydrated. Even when you don't know what is making you feel this way, it is soooo important to talk it out. Find someone you trust, tell them how you feel. They might even feel the same way you do! If you know what is giving you anxiety, confide in them. Let them know. Again, you are not alone. This is something that is really helpful when you are struggling and something that I don't do enough. Whenever I'm feeling anxious, I tend to isolate myself and hold my feelings in, until I combust. You do not want to combust. It's okay to let it out. It's okay to talk about it. I think it is very crucial that we open up and speak out against the stigmatization towards mental health. SO LET'S OPEN UP, MY FRIEND. Every time I read a post- LIKE THIS BEAUTIFUL ONE RIGHT HERE- it makes me feel not so alone. So, speak up. You might even help someone. I completely feel you. I have experienced high anxiety levels many times, but they were usually because I was around a certain person who used to abuse me. So, that can be a little nerve wracking, you know? I do still get anxious sometimes (especially at night, but I'm learning to cope and feel so much better than I used to. Let me just say that I am so relieved that you were able to relate to this post. I truly believe that we all experience anxiety even if they are all in our own different ways. You know what I mean? I am so happy you have found a way to cope with your anxiety and I am so glad you feel better. That is like me- I used to have really bad social anxiety but I've overcome it and I think it's just something that grows with you sometimes. Thank YOU so much for reading and sharing. <3 Love you, girly! THAT RIGHT THERE SOUNDS LIKE MY ANXIETY. I adore the way you have talked through what you have struggled with. This post was everything for me to read at the moment. I've been on an anxious kick since summer term started (four weeks ago) and it is daunting. I'll make through this however. I'm glad that you were able to write such a connective piece. This post has put me at ease with my current mental state right now. <3 LOVE YOU. OKAY I AM DEFINITELY CRYING RIGHT NOW. <3 My eyes are watering... You have no idea how much your comment means to me. I love that I was able to write something that could mean something to you. I'm so sorry to hear that you have been struggling with anxiety lately. I have been myself and it's honestly the worst because it's summer and you should be having fun! I'm here for you if you ever want to just talk about it and get it out of your system. <3 LOVE YOU TOO, GIRLY!! Awwww I loved this Kenzie!! I don't think many people realize that a lot of times when you have anxiety you don't really know why. Thank you so much for reading, girly! You described so much of what I've experienced. The not knowing what's wrong. The lack of sleep. The nerves on edge. The fear. It's so much more than being stressed out. It's having trouble breathing and waking up in the middle of the while having a panic attack. I relate to this so much. You are not alone. <3 <3 Thank you for this article. You have no idea how much it means to me that you were able to find yourself in this post. I think it is SO so so SOOOOOOOOO important that people who suffer from anxiety know that they are NOT alone. It's such a scary feeling and sometimes it's hard to talk about it... But I am here for you. <3 Sometimes when I have anxiety, I feel like only I can fix it... And, you know, that's not the case. It's okay to reach out and say "hey, I'm really not doing great." and ask for help. Thank you so so so much for reading and letting me know I'm not the only one. <3 You are amazing. Wow thanks for this post. It helps me understand other people better you know. People talk A LOT about social anxiety as if they expect me to know exactly what it is like (and I should know, I suppose - I should look it up when I hear about it) but people rarely explain what it actually is like. SO THANKS AGAIN. BEAUTIFUL POST. I don't experience this much myself - the most stressful times for me are before science exams and I might feel sick and really jittery and just so empty inside but ... it doesn't happen very often. Would you say that ... SOCIAL ANXIETY is a thing in itself like what CERTAIN PEOPLE have and experience vs just regular stress and anxiety everyone experiences at different times, depending on personality?? That sounds confusing, let me rephrase. IS SOCIAL ANXIETY LIKE A CONDITION (*cringes at my wording - no one be offended) that some people get or is it just that some people get super anxious about people/crowds and that it could basically happen to anyone at any time depending on their personality?? SORRY SORRY FOR MY SUPER CONFUSING QUESTION. HI LISA!!!!! Wow, you are so sweet. Thank you so much for reading this post! I'm so happy that I was able to give you a little insight on this topic. I think that it is a little bit of both. I remember taking psychology and I mentioned to my professor that I had social anxiety and she looked at me RIGHT IN THE EYE and said: "No, you don't." And then she told me how someone with social anxiety wouldn't be able to psychically get up in front of a class to do a presentation. They just *wouldn't* be able to do it. And to me, that is definitely a condition and I wouldn't say that my anxiety was to that level because (spoiler) I actually did a presentation in front of my class (and shook the whole time). But when she said that to me, I kinda felt... I don't know. Lesser? Like I wasn't being understood? Because I wanted to tell her NO I REALLY DO HAVE SOCIAL ANXIETY!! So, I think people have it on different spectrums. If it's SUPER extreme to the point where you can't leave your own house, then I'd definitely say that it is a serious condition. But I don't know if I would say that it depends on personality because my sister (who is SUPER outgoing and super extroverted) sometimes has social anxiety and so I think it's something that could happen to anyone. And I suppose, for me, the best way to describe what social anxiety feels is... Knowing that you have to be at some sort of social event and feeling like you're hanging over the edge of a building until the the day comes or it's over with. And it's thinking of all the possible things that could go wrong or planning EXACTLY what you are going to say in case someone tries to talk to you so that you don't mess up and say something stupid and regret it for the rest of your life. It's feeling relieved when the social plans don't work out because NOW YOU DON'T HAVE TO BE WORKED UP OVER NOTHING. It's thinking of excuses to get out of the social situation but also praying that it works out because lol you wanna be a normal human being. as someone who struggles with anxiety themself, let me just say that this post was so true and amazing. i loved this post. I'M CRYING. THANK YOU SO MUCH. <3 It seriously makes me feel so good to hear that you were able to relate to this and to know that I'm not alone. Anxiety is such a complicated thing in that it's unique for every person. I think talking about it is such a healthy way of trying to conquer it and I admire your bravery for talking about something so personal to you. YES! I couldn't agree more. <3 Like I said above, everyone really does experience it in their own ways and on some certain degree- some more than others. But it truly helps to talk about it and not be afraid to speak up. :) Thank you for your kind words. 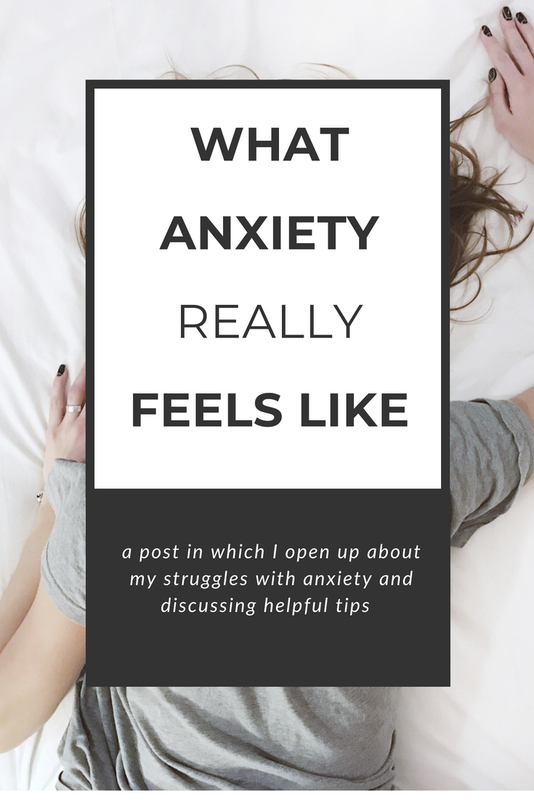 Although, I don't struggle with anxiety, I can definitely relate to the feeling of helplessness and wondering, and the "what the heck is wrong with me?" question. I love knowing how people define things like mental health, because it can mean so many things to different people. Thank you so much for reading. <3 You are so lovely.